Why do I do what I do? I have been asking this of myself before approaching any meaningful labor over the last few weeks. My initial motivation for asking “why” stems from watching Simon Sinek’s TedTalk, How great leaders inspire action. I was further motivated in reading a timely post by Scott Dinsmore, who apparently met Sinek and came away inspired to reinforce his revolutionary path to personal freedom. On with the chain reaction…. If you watch Sinek’s talk, you will grasp his basic message: By understanding and conveying why (we do what we do), we inspire action. Action on the part of our audience, our customers, whoever it is we intend to pull into our cause. In short, this is what great leaders do. Inspiring leaders start with why. This post is dedicated to the question of why, specifically as it pertains to my blog. I could obviously choose to explore other current areas of my life (e.g., work or triathlon training), but will save those for another day. I’ve been curious to understand the value of blogging anyhow; hence, the focus for this exercise. Now that I have identified my activity, let’s get on with it. 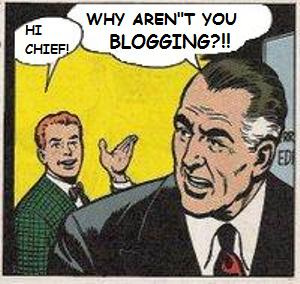 Why do I publish this blog? 1. To improve my writing—It’s not easy for me to write; it never has been. It takes time to post content of quality. It takes thoughtfulness and consideration of a readership, both regular and potential. But I enjoy it. There is a strong sense of continual improvement in writing that is gratifying to me. I believe that effective written communication is as essential as ever before. Although diluted perhaps in the digital era, the importance of writing is not gone. Nor is it just for non-business types: one read-through of Jaime Dimon’s latest letter to J.P. Morgan's shareholders (of which I am not) provides proof to that end. Anne Lamott, author of the superb book on writing, Bird By Bird: Some Instructions on Writing and Life, writes, "If you are a writer, or want to be a writer, this is how you spend your days – listening, observing, storing things away, making your isolation pay off. You take home all you've taken in, all that you've overheard, and you turn it into gold. (Or at least you try.)" Readers, this is true. 2. To chronicle life events—Weblogs, like so many things in life, are me-focused by nature, and mine is no exception. If I don't watch myself, my posts can quickly become “dear diary” sessions. Although I'm fortunate to have had many unique experiences in my life, through travel and curious living and whatnot, I’ve never been one to snap a lot of photos, usually relying on memory to carry worthy moments into perpetuity. This blog, however, is the place to not only capture experiences, but also enhance them—a definite improvement upon my memory! Since kicking off FMOC in 2009, I've shared roughly 40 entries. 3. To discover and create—I’m always willing to try new things, and this blog is an example of that willingness. Blogging has become my creative outlet, just as yours might be playing the banjo or painting a picture. The process of observation and regurgitation, although rigorous at times, is rewarding to me. 4. To add color to my corner—FMOC covers a miscellany of topics. I'd like to think that I’m performing an act of greater goodness with it, but come on, that's a mighty bite to chew. This blog is for me. It is about making my little corner of the universe more fun and interesting. If I can provide content which is relevant to others now and again, that's time well spent. Inspirational... well, that's a bonus. 5. To inspire and teach—This is my reach: if I can give people ways to solve problems, to think creatively, or in the case of this post, to get inspired into action, I've gotten all I want and more from FMOC. Here's the deal: I want to improve my ability to convey my experiences and perspectives so that they can be useful to others. I admire people who clearly communicate subjects, no matter the audience. It's a gift that few have. I have grown (if I may be the judge) in my ability to write. FMOC is living proof. I'm not a writer, but in a sense, I'm becoming one. My hope is that eventually, in a way not yet visualized, this blog can become a vehicle for effective teaching (not professing!). I have a vision that life lessons can spring and flow from FMOC, and that these lessons will serve as a source of material from which others can draw and apply productively. My immediate hope is that this post will be of use to you, and that you may incorporate a similar process of discovery by asking yourself the same question: why do you do what you do? 1. Get started by picking an activity to which you devote time and energy. This could be your job, own company, or a hobby about which you feel passionate. 2. Ask yourself the question, why do I do what I do? And so it all begins, your inspiring others into action. To my knowledge, there’s no formal format for how to answer the question (at least not in this case). I chose to keep a list, because that’s how I tend to do things. 3. Feel free to share why you do what you do in the comments section of this post. What is your purpose, cause or belief? Have I prompted you to consider the why of what you do? I like it - good stuff! Good inspiration!!! !